US senators have voted overwhelmingly to outlaw cruel or degrading treatment of detainees held in US custody abroad. The Senate voted 90-9 in favour of the motion, which senators said would lay down rules for troops and officials carrying out interrogations. 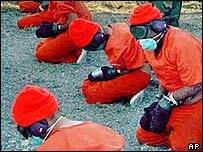 Prisoner abuse scandals at Abu Ghraib jail in Iraq and concern over the treatment of detainees at Guantanamo Bay have dogged the US since 2001. The motion was opposed by the White House, which views it as unnecessary. Bush administration officials say the move would be restrictive, and limit its fight against terrorism. Republican Senator John McCain tabled the motion as an amendment to a Pentagon funding bill. Correspondents say the Senate vote showed a boldness from Republicans willing to challenge the White House. President Bush could veto the entire $440bn (£248bn) bill to defeat the motion - but is unlikely to do so as he has not blocked one during his time in office, they say. The Pentagon has consistently blamed the Abu Ghraib abuse on a handful of rogue soldiers, most of whom have been tried and convicted by military courts. Mr McCain said the amendment sent a clear message to the world that America would not condone any inhumane practice. "Prisoner abuses exact on us a terrible toll in the war of ideas because inevitably these abuses become public," he said. "When they do, the cruel actions of a few darken the reputation of our country in the eyes of millions." The new measure would require all service members to follow procedures in the army field manual for treatment of anyone in US military custody. Another amendment due for consideration by the Senate soon would clarify the legal status of enemy combatants. Mr McCain said that while the administration might want ambiguity over the terms of reference for detainees, US soldiers were "crying out for clarity". He also read a letter of support from former Secretary of State and retired general Colin Powell. Mr Powell wrote that the new measure would "help deal with the terrible public diplomacy crisis created by Abu Ghraib". Supporters of the amendment also hope a commitment to treat detainees fairly when in US custody will help to secure humane treatment of US nationals or servicemen captured abroad. The Senate vote comes at a time when the president's approval ratings are at an all-time low, although they have been recovering from a dip in the wake of Katrina. 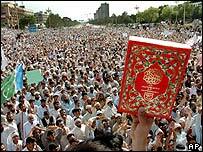 Popular resentment to the US has grown in the Muslim world since the US-led invasion of Iraq in 2003. The Abu Ghraib images, which showed hooded Iraqi detainees corralled into naked human pyramids, or cowering in front of guard dogs, were seen across the Middle East. Stories of abuse and maltreatment of prisoners have fuelled reactions to stories such as the alleged desecration of the Koran by US troops at Guantanamo, which prompted widespread anti-American demonstrations in many countries. But the White House views any codifying of rules for interrogation as potentially restrictive and a possible source of legal insecurity for US troops.